AUT's event production students recently rolled up their sleeves to help out Oxfam New Zealand raise awareness of climate change in the Pacific- free of charge and with global results. Climate change costs lives. It's already having a devastating impact on poor communities in developing countries, particularly in the Pacific. To spread the climate change message Oxfam New Zealand recently enlisted the help of AUT’s event production students to raise awareness of climate change among Pacific youth in New Zealand. The student teams each created a unique event to bring to light the issues which surround Climate Change, relative to young people. 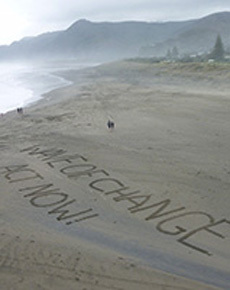 The individual events took place in October under Oxfam’s “Wave of Change” campaign banner. Shirley Everton from Oxfam New Zealand says the students’ events were a way for Oxfam to get the Climate Change message across to a wide audience utilising young, creative, fresh, talented skills. “We are a not-for-profit organisation so the skills and resource from AUT for something like this is extremely important,” she says. Every semester AUT’s Event Production students work with local non profit organisations to produce events that are of benefit to the community. Alison Booth, AUT event production lecturer, says AUT has always insisted that its students take part in real life campaigns with small or no budgets. Some of the events organised included short film clips, sand sculpture contests, ‘Trade for Treasure’ was a recycled clothing stall in the AUT Hikuwai Plaza, while the ‘Hands of Hope’ was an interactive filming booth that encouraged people to make a wave of change to show support for Government climate change action. As part of the planning for the event, students went on a field trip to Piha where a photo was taken that has been picked up by Oxfam globally to use as part of their international brand campaign. Following the success of the events carried out by AUT students, Oxfam have offered internship opportunities for students working in their campaigns team on the annual Fairtrade campaign- Oxfam’s Biggest Coffee Break.